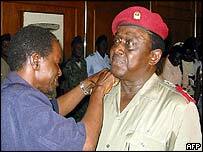 General Verissimo Correia Seabre has declared himself president of Guinea-Bissau after seizing power in a coup. The army chief of staff says he will remain leader until elections are organised in the West African state. Soldiers have announced they are setting up a transitional government to include "all national political orientations". They are holding President Kumba Yalla in detention, although they have promised to release him later. A curfew was imposed on Sunday night in the capital, Bissau, with soldiers patrolling the streets, but the city is reported to be calm. The coup came at dawn, following an announcement on Saturday that the president would have to cancel them again. The fate of Prime Minister Mario Pires, who is in the south of the country, was not clear with reports that the army was seeking to detain him.